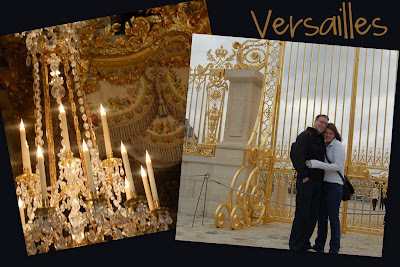 When I studied in Paris, we went to Versailles and spent a whole day looking at all the beautiful grounds and buildings. We had a little tour of the chateau and learned a lot about Marie Antoinette from a very sympathetic source. My professor insisted that her oft quoted saying, "Let them eat cake" was really misinterpreted and that she actually said, "Let them eat brioche." Now is there a difference? He says that she was told the peasants didn't have any bread, and she replied, "Well them let them eat brioche", since she didn't understand that they didn't have any bread at all, much less eggy buttery deliciousness (i.e. brioche). Maybe she was rude, maybe she was just really ignorant, but definitely, she lived in style. And now whenever I eat brioche I think of her and her gorgeous bedroom. By the way, happy Bastille Day! I'm sure it wasn't a great day for Marie Antoinette, but we're having a big French dinner tonight with photos and recipes to come soon. This brioche tart is unlike any other brioche I've ever eaten. It came together quickly in my beloved KitchenAid and the recipe was simple enough my little guy could help without causing too much trouble. After an overnight stint in the fridge, the dough was pliable, fragrant, and cooperative. I used my deep tart pan and covered the dough with strawberry jam, plums, and sugar tossed walnuts. It browned a little more than I liked in the oven but smelled so good that were I French royalty, I'd encourage all of my constituents to eat this instead of any old baguette. However, when I sliced it up (after the obligatory rest, brioche might be delicious but it's certainly a little high maintenance) it was too juicy. Next time I'll use less jam (just enough for the tiniest layer) and make sure that the dough is thinner on the sides and thicker on the bottom, since my Tall Man shies away from anything that even looks like it might be soggy. Even so, the flavors were amazing and he said, "Wow, that tastes like spring! Let's do it with peaches next time!" With a few modifications, there certainly will be a next time- because even in the heat of summer, my kitchen is happy with the scent of brioche and the memories of Versailles. Don't miss the other Tuesdays with Dorie creations and make some brioche of your own. This is stunning, Anne! I am like your husband in that I also hate anything that remotely resembles soggy bread, so I used little jam in one of mine *the other had Nutella, and you can never have enough of that). It brought back memories of Paris for us, too! I was really afraid of the soggy part, but surprisingly, it wasn't. Maybe it's because I sort of overbaked it a tad..haha. Your tart looks beautiful! Oh Anne Strawberry,you are such an inspiration ! LOVE your post. Very stunning tart!!! As usual, I love your photos! Beautiful! Mine had a soggy middle, so I'll remember your suggestion to make the bottom slightly thicker next time. Your tart looks amazing! I want to try peaches too! Beautiful tart - and lucky were you to have studied in Paris? Your brioche tart looks absolutely perfect! Great job! Nice looking brioche, even with the soggy parts. I tried blueberries with mine! Brioche is definitely worth putting in the extra effort. Anne!! That looks incredible. Beautiful!! Too bad about the soggy, but I bet the rest of it well made up for a little soggy!! The Marie Antoinette/brioche story kind of reminds me of something I saw on TV a few years ago where some very richy socialite - not Ivana Trump, but someone like that - was taken to K Mart to shop, and didn't understand the whole "6 items maximum in the fitting room" concept. They tried to explain it to her, but she just didn't have the frame of reference needed to process it. Anyway, your tart looks amazing! I love how you presented this - so gorgeous and impressive! And I guess it really could taste like just about any season depending on the fruit you use! Your tart is absolutely gorgeous! I'm a bit late with mine this week so I'm really enjoying reading everyones' posts and learning from their tips. 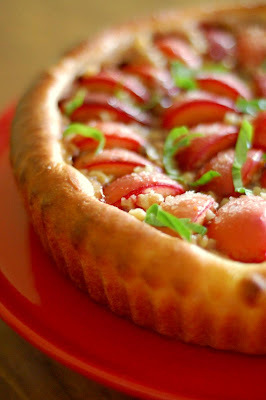 Your Brioche Plum Tart looks beautiful! The color is so vibrant! Is that mint you used as a garnish - the color green really pops out! This is really beautiful Anne! I love when food taste like spring! Your tart looks fabulous and delicious! I made a TWD Rewind cookie, but seeing all these gorgeous, tasty looking brioche makes me really wish I'd have made it. Hmmm. LA's- I forgot to mention that it's basil on top. It went perfect with the plums and I couldn't resist the color it added! Your tart is gorgeous! 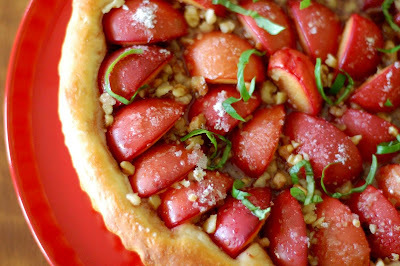 I still haven't made this one, but I want to use nectarines when I do (hopefully this weekend). Delish! And will take your advice about the brioche. Your brioche tart is lovely, Anne! That came out so beautifully! Nice job! oooooo sweet anne ! No way ! TJ Maxx has La Rochere glassware in VERSAILLES.... I PICKED THEM UP FOR 2.99 A STEM ! "La Rochere Versailles glasses created from actual decor found in France "
They are uber expensive at dept stores. Overstock.com has them, but not as cheap as TJ Maxx. Lovely tart and a lovely post!